Seeing a chiropractor for the first time can be scary at times and sometimes you might even wonder what is it exactly that we do. We have gathered some of the most common questions to help you understand more about chiropractic care. Have you been in a car accident? Make sure that you’re getting the care you deserve. We will make sure that you get the proper diagnosis and treatment for your specific injuries. We offer a variety of different treatment options in our office such as Manual adjusting, Activator technique, Flexion distraction, Decompression, Graston, & Massage therapy. We are able to bill your insurance if a claim has been made and we also work with a network of attorneys that can help you with any questions you may have about the accident. Call to get a free consultation and start feeling better today. Chiropractic is a health care profession that focuses on disorders of the musculoskeletal system and the nervous system, and the effects of these disorders on general health. Doctors of Chiropractic believe in treating the cause not just the symptoms. Doctors of Chiropractic offer a drug-free hands on approach that includes a thorough physical exam, accurate diagnosis, and evidenced based treatment. In addition to their expertise in adjusting, doctors of chiropractic have broad diagnostic skills and are also trained in therapeutic and rehabilitative exercises, as well as to provide nutritional, dietary and lifestyle counseling. Chiropractic care cures a number of conditions including low back pain, plantar fasciitis, headaches, neck pain, sport injuries, disc herniations, hand and foot pain and several more. Call today to see if chiropractic care can help your condition. The first step in getting the correct treatment plan for your condition is to tell your doctor about all your symptoms and any changes in those symptoms as the treatment progresses. Do not minimize symptoms: even if you feel that they are not related to your condition. Next a customized treatment plan is created just for you involving our many treatment modalities here at Comprehensive Chiropractic. What Should I Expect From My Chiropractor? During your first visit the Doctor will complete a thorough examination that last about 40 minutes and typically includes: Patient history, Physical examination, Diagnostic studies (when indicated), Diagnosis, and an evidence based Chiropractic treatment plan. Doctors of Chiropractic may assess patients through clinical examination, laboratory testing, diagnostic imaging and other diagnostic interventions to determine when chiropractic treatment is appropriate or when it is not appropriate. Chiropractors will readily refer patients to the appropriate health care provider when chiropractic care is not suitable for the patient’s condition, or the condition warrants co-management in conjunction with other health care providers. To receive the doctor of chiropractic degree, candidates must complete a bachelor’s degree that includes extensive undergraduate prerequisites and four years of graduate-level instruction and internship at an accredited chiropractic institution. 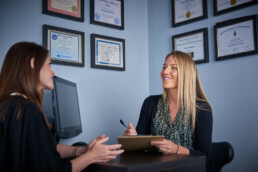 Comprehensive knowledge of all systems of the body and diagnostic procedures enable the DC to thoroughly evaluate a patient, address disorders relating to the spine and determine the need for referral to another health care provider. The curriculum includes laboratory work in anatomy, physiology, public health, microbiology, pathology and biochemistry. Focus on specialized subjects, including chiropractic philosophy and practice, along with chiropractic diagnosis and adjusting methods. Since chiropractors don’t prescribe drugs, instead of studying pharmacology and surgery, they receive an even deeper training in anatomy, physiology, rehabilitation, nutrition, diagnosis, X-ray and a variety of adjusting techniques that aren’t taught in any other health care field. Educational requirements for today’s chiropractor are among the most stringent of any of the health care professions. Several decades ago the education that chiropractors received was purposely narrow. Chiropractic is widely recognized as one of the safest drug-free, non-invasive therapies available for the treatment of neuro-musculoskeletal complaints. Although chiropractic has an excellent safety record, no health treatment is completely free of potential adverse effects. The risks associated with chiropractic, however, are very small. Many patients feel immediate relief following chiropractic treatment, but some may experience mild soreness or aching, just as they do after some forms of exercise. Current literature shows that minor discomfort or soreness following spinal manipulation typically fades within 24 hours. A growing list of research studies and reviews demonstrate that the services provided by chiropractic physicians are both safe and effective. The evidence strongly supports the natural, whole body and cost-effective approach of chiropractic care for a variety of conditions.